Hilton Dubai Creek is a 5-star located on the banks of the Dubai Creek. It offers luxurious accommodations and elegant dining, including Gordon Ramsey’s exclusive restaurant, Verre. The Hilton Dubai’s rooms feature contemporary decor and marble bathrooms. All rooms are equipped with a Hilton Serenity Bed and deluxe bedding. The rooms are modern with flat screen TVs and high speed internet access. The Hilton Dubai Creek offers a complimentary shuttle service to its sister hotel on Jumeirah Beach, where guests have access to the hotel’s beachside facilities. Guests can relax in the rooftop swimming pool while enjoying views of the city, or exercise in the fully-equipped fitness center. 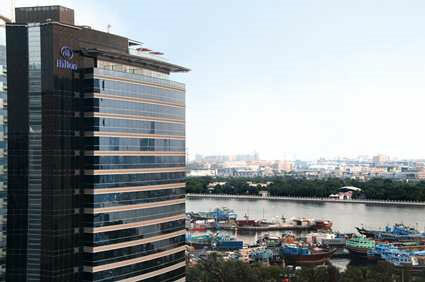 The Dubai Creek Hilton is less than a 10-minute drive from many of Dubai’s top attractions and malls, including the Sharjah Aquarium and the Dubai Mall. It is 3 miles from the Dubai International Airport. Free parking and airport shuttle service is available.